Take Action: Save Florida Forever! Tates Hell State Forest, a project of Florida Forever. Florida Forever is Florida’s premier conservation and recreational lands acquisition program, and provides a solid blueprint for conserving the state's natural resources. It is the largest public land acquisition program of its kind in the United States. 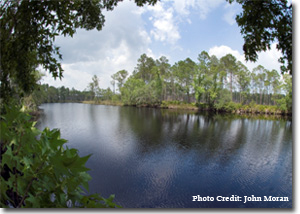 Since its creation in 2001, over 2.4 million acres have been purchased and protected under the Florida Forever program. New Florida Governor Rick Scott's budget was released Monday afternoon (2/7/2011) and contains no funding for Florida Forever. While this is a disappointment, our efforts are undeterred. We look forward to working with the state Legislature in the coming months to make sure that Florida Forever is adequately funded. Gov. Rick Scott's budget blueprint must still be approved by the Florida Legislature, which meets for session in March. Until then, we need to make our voices heard and ensure our elected-officials fully fund the Florida Forever program.